Maryland Photographer Patrick Smith || Photoblog || Patrick@PatrickSmithPhotos.Com: Agudio or Guido? 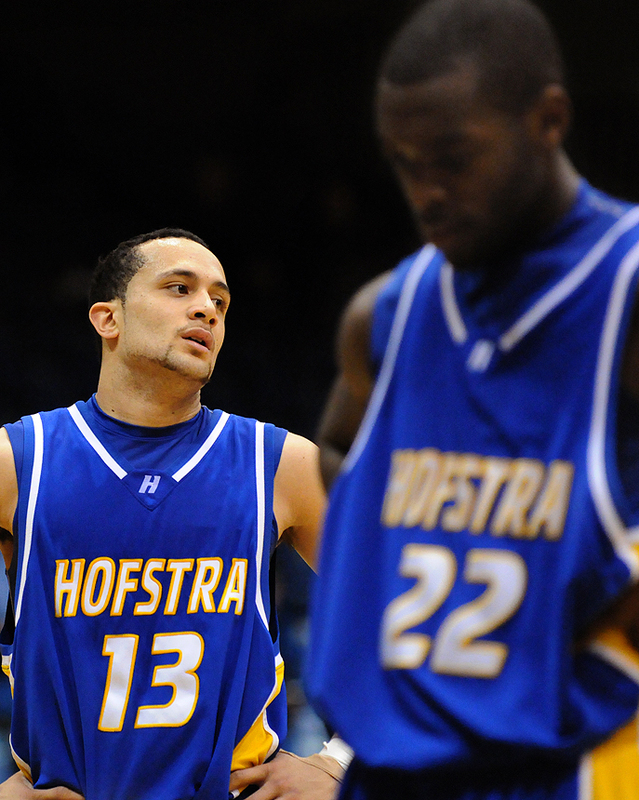 "Hofstra guard Antoine Agudio (no.13)and forward Charles Jenkins exhibit frustration after a missed free throw late in the second half against Towson at the Towson Center Wednesday night. Agudio made only 3-of-15 attempts from the floor in the 60-51 loss." 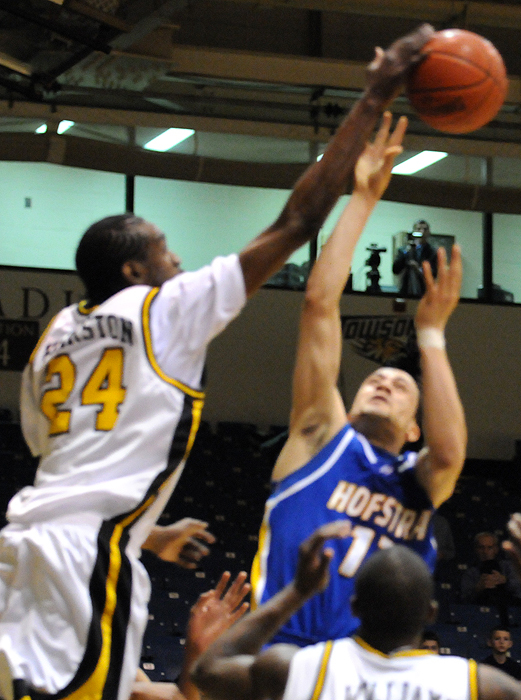 Hofstra is a big Colonial Athletic Association rival of Towson. No matter what the sport, be it football, lacrosse or basketball, the matchup always brings out a decent sized crowd to Towson. While the crowd was not record setting by all means, students filled the stands making up about 70 percent of the fans base Wednesday night. Having shot one or two games at Towson during my winter break, it was nice to see more than 100 fans at a game. In the crowd and camped out behind the far end basket was the Towson fan group T-Unit. This club tries to build better student attendance, at the mainly commuter school, yet never makes a full squad appearance at every game. In addition, they enjoy firing up the rest of the crowd and shouting obscenities to the other team, mainly the coach and star player. Nonetheless, much as I remember from last year when Towson squeaked out a home victory against Hofstra, 94 - 91, their main target was guard Antoine Agudio. The minute Agudio, a Long Island native, walkes through the locker room door each visit, the name "Guido" resonates from the T-Unit section of the Towson Center. It's funny, because this is a term I hear often used on the Towson campus, as a large majority of students reside in New York and New Jersey. My only thought is there are no New York students in T-Unit or other Towson fans that take no offense to it. In any case, I don't know if it was the T-Unit's continual banter or an off-game by Agudio, but Towson came out victorious. A lot of pressure was put on Agudio by the Tigers and I knew if Hostra didn't win, I wanted to move an image showing his notable frustration. I had made some images of him getting swarmed by Towson players and having the ball stripped, but I liked the subtle (above) reaction shot late in the second half. I was going to run with this photo, but I was caught off guard after a timeout and couldn't frame get the image in focus quick enough. It happens and not even eight frames per second and cat-like-reflexes can save you when you're not ready for the action.